New Zealanders can now get their hands on the new iPad Pro through Vodafone, with the telco offering Apple’s latest tablet with a range of data plans. Unveiled by the tech giant in September, the new iPad Pro features an Apple Pencil and Smart Keyboard, in a move designed to bring greater levels of productivity to the device. Featuring a 12.9-inch Retina display with 5.6 million pixels to match - the most ever in an iOS device - the tablet also brings new performance to the table, with the new 64-bit A9X chip, rivalling most portable PCs. As Philip Schiller - Senior vice president of Worldwide Marketing, Apple - remarked at the time of the unveiling, the iPad Pro stands tall as Apple’s “most advanced and powerful” iPad ever made, as feature Cupertino hopes will lure Kiwis into pre-Christmas purchases. Kiwis can can order iPad Pro through Vodafone’s online store - as well as Apple’s online store and selected Apple retailers - with a range of sata plans that will allow customers to connect to its 4G network with speeds up to 150 Mb/s. Apple says the new larger iPad Pro is thin and light and provides all-day battery life - seen as key improvements and differentiators from rival devices. There are more than 850,000 apps in the App Store designed specifically for iPad, and the new iPad Pro will enable a new generation of advanced apps for everything from productivity, design, illustration, engineering and medical, to education, gaming and entertainment. 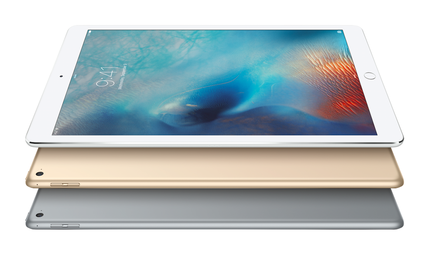 “The early response to iPad Pro from app developers and our customers has been incredible,” Schiller adds. “iPad Pro gives users the ability to be even more creative and more productive with the epic 12.9-inch Retina display, powerful 64-bit A9X chip and groundbreaking Apple Pencil and new Smart Keyboard. Apple hopes that its new Smart Keyboard will also further extend the utility of iPad Pro, offering a full-sized keyboard in a thin, durable design. The Smart Keyboard, available for purchase separately, attaches to iPad Pro’s Smart Connector port, eliminating the need for a separate battery, on/off switch or Bluetooth pairing. In addition, Vodafone will also offer Apple Pencil for iPad Pro and Apple’s new Smart Keyboard in a US English layout. Apple says the iPad Pro starts at $1,399 for the 32GB with Wi-Fi model, $1,679 for the 128GB with Wi-Fi and $1,899 for the 128GB with Wi-Fi and Cellular. All devices come in three metallic finishes including silver, gold and space. Also, the Apple Pencil will be available for $189 and the Smart Keyboard will be available in charcoal gray for $319.